Good news: I ended up getting in another 2.5 miles last night (after cutting my morning run super short). After taking a SIX hour nap (can sleeping for that long even be called a nap?!) I headed to the gym with Adam to run on the treadmill. 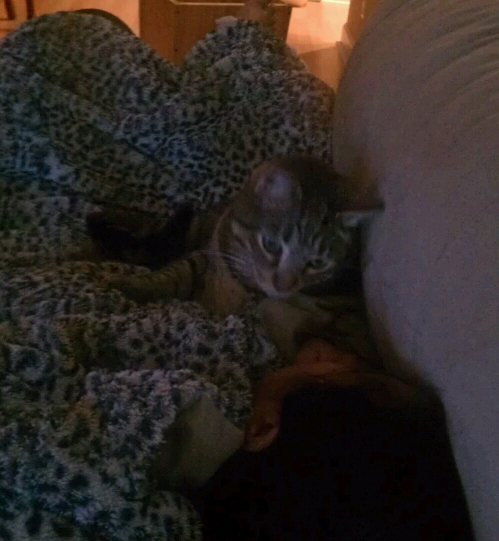 As usual Cecil took his duty as Security Cat really seriously and kept a close eye on me as I napped. Alright so, six hours is a ridiculous amount of time to sleep on a beautiful Saturday but I really needed it. The last two weeks I’ve barely been getting any sleep at all. I lay in bed for hours before falling asleep and then I wake up shortly after that wide awake. In case you were wondering, there are no good Facebook or Twitter updates to read at 3am because everyone is sleeping. I really have no idea what’s been causing this odd sleeping pattern but I guess it all caught up to me today. Anyway, I was excited to hit the treadmill because I bought new running shorts Friday night and needed a nice short, easy run to try them out on. I normally run in capris and love them a lot. However, after getting caught in the rain last weekend I decided I needed to try out some light weight shorts. The capris are great but they weighed about 500lbs after the rain. I’ve been hesitant to try shorts because I’m terrified of chafing on my inner thighs. I can’t remember when the last time I chaffed there was, but I do remember that every time it has happened it has been painful. 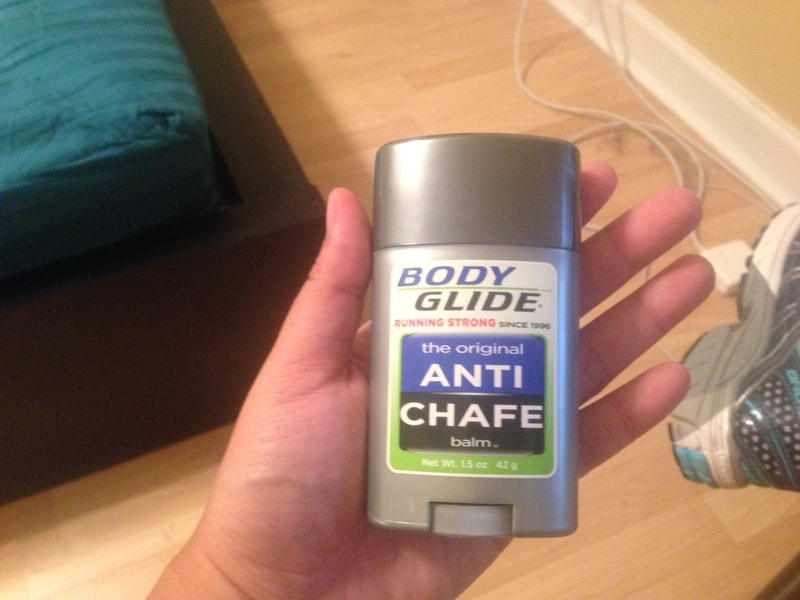 So, when I picked up my shorts last night I also picked up a stick of Body Glide. (Please excuse the huge pile of cat hair in the background. My cat is shedding like crazy). Tonight was the first time I’ve ever used Body Glide. I was worried that it wouldn’t work but that was an unwarranted fear because it worked perfectly! 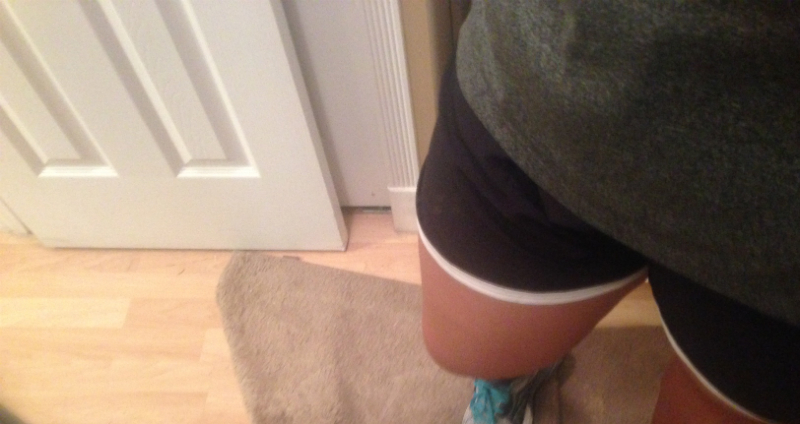 Running in shorts = success! That being said, I don’t know how often I’ll be running in shorts due to their extremely high cost! I mean, $40 for a pair of super light weight shorts is a little much, no? I know running clothes and shoes aren’t ever really cheap but I was expecting the shorts to be closer to the $25 range. I guess I was dreaming! I’m thinking about trying some of those spandexy running tights for winter – thoughts? Yes/No? i used to always run in capris, too … but in these Florida summers I finally gave in and tried running shorts. It’s changed my world! Rarely will I go for a run in capris now (come “winter” I am sure I will though). Try Ross or Marshall’s. I’ve gotten Nike and Adidas running shorts for $10ish. Awesome tip on the $10 shorts – thank you!! Hi Kristina. Thanks for finding me! This post was absolutely something I would have written. I am running a marathon soon and I am debating about running in shorts for fear of chafing. When I use Body Glide, I am perfectly fine, but I am afraid it will wear off after 20+ miles. I just got into running shorts this summer after years of capris or compression bike shorts. I have found some good sales on some of my favorite pairs (mainly Moving Comfort, Nike, and Go Lite). Moving Comfort has great sales on their Momentum shorts, but usually on the bright colors that do not match half of my tops. Not that I care though when they are $27 instead of $46. Ohhh I’ve never heard of the Moving Comfort or Go Lite brands, I am checking them out now! Thank you!